" . . . relay this information to Earth. Tsien destroyed three hours ago. I'm only survivor. Using my suit radio – no idea if it has enough range, but it's the only chance. Please listen carefully. THERE IS LIFE ON EUROPA. I repeat: THERE IS LIFE ON EUROPA. . . "
Europa, one of the Jupiter's large moons, holds a special place in the minds of science fiction writers and astrobiologists alike. What sets Europa apart from the other planets and moons in our solar system is that it is covered with a fairly smooth surface layer of frozen water, and its interior is much hotter than its surface, suggesting that there could be a zone of liquid water under that protective layer of ice where life might exist. That easily accessible source of water on its surface could also make Europa a handy refueling stop for space ships exploring the outer solar system – assuming there isn't the sort of life that destroyed the ill-fated spaceship Tsien in Clarke's 2010. 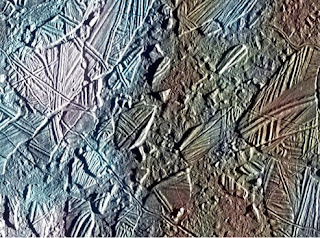 Prior to the Galileo mission, scientists' knowledge of Europa was simply a small ice- covered moon with an exceptionally bright surface covered by faint curved and linear markings. Now, scientists see evidence of a young and thin, cracked and ruptured ice shell, probably moving slowly over the surface of a briny ocean that is 100 kilometers (62 miles) or more deep. Judging by how quickly Europa's surface ice is replenished, Richard Greenberg estimates that enough oxygen reaches the subterranean ocean to sustain "macrofauna" -- more complex, animal-like organisms. Assuming Europa life forms would need as much oxygen as Earth-like fish, Greenberg estimates the moon's ocean has enough oxygen to support 6.6 billion pounds of macrofauna. Life could be visible from orbiting spacecraft, however, if it made a home in cracks in Europa's shell that connect the surface to the interior, Dyson said. Such life might take the form of flowers with a parabolic shape that focuses the dim sunlight falling on Europa on the interior of the plant. Flowers with such shapes [...] are found in Arctic climes on Earth, where the plants have evolved to maximise solar energy. Europa flowers could be detectable through a phenomenon called retroreflection, in which light gets reflected back to its source, Dyson said. This optical effect is seen in light reflected from animals' eyes, and was used in the design of road signs and mirrors left behind on the moon by Apollo astronauts. As for Dyson's flower suggestion, he says it is "a very radical" idea. "On Earth, flowering plants evolved during the Cretaceous and became diverse by co-evolving with insects. . . . 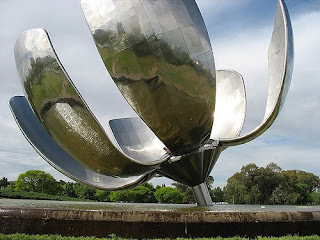 I would not include flowering plants to my list of life-forms to look for." "Any photosynthetic system on Europa would have to live at a depth removed from the high radiation bombarding the ice surface and still get light," Baross says. "Having said this, it would be worthwhile to make more comprehensive observations and analysis of some of the surface features, including the deeply coloured ridges [...]," he says. "One might find evidence for biosignatures or very interesting chemistry." More likely than surface flowers are organisms similar to those found around the deep sea hydrothermal vents on Earth. 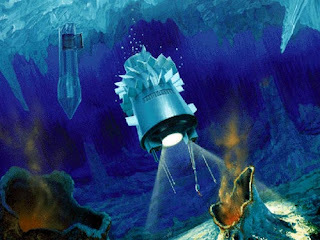 Frank Carsey and his colleagues at the Jet Propulsion Laboratory are designing robotic vehicles that will be able to cut through ice and explore the watery world beneath, initially in Antarctica, but with the hope of eventually exploring Europa's depths. Until we are able to send exploratory probes, the possibility of life on Europa is little more than educated speculation. Top Image: The Conamara Chaos. "a view of a small region of the thin, disrupted ice crust in the Conamara region of Jupiter's moon Europa showing the interplay of surface colors with ice structures." From NASA's Galileo Image Gallery. More details. Middle Image: Europa and the Thrace Region. 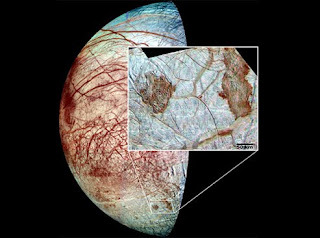 This image shows an image of the cracked surface of Europa. From NASA's Galileo Image Gallery. Bottom Image: Artist's concept of a cryobot and hydrobot that can melt through ice and then explore the water beneath. From "The Search for A Planetary Ocean on Europa" at JPL. Just read A Spy in Europa. No particularly novel concepts, but the world building is very good and it weaves its strands in interesting ways. I read Dyson's hypothesis when it first showed up -- he actually did propose angiosperms, including the idea of "seeding" into space (!). Problems, such as photosynthesis and heavy-duty mutation from Jovian radiation, were dealt with by handwavium. Greenberg's book was also discussed in Centauri Dreams. His belief that the Europan ice crust is thin would make a drilling expedition more feasible. P. S. I deactivated my Facebook account -- too little signal, too much noise. You know where to find me, if so inclined! This is very informative. I never knew how amazing the Europa is until I read the Spy in Europa. Very interesting book. Can't even put it down. That was very informative! I never knew about Europa's condition. very nice.That was very informative. read the Spy in Europa. Very interesting book. The world building is very good and it weaves its strands in interesting ways i mean (A Spy in Europa).